Senior Research Fellow James Kennaway explores how surgical suffering played a key role in Nelson mythology. My project on ideas of fortitude in nineteenth-century military surgery inevitably leads to a consideration of the case of Admiral Nelson (1758-1805), the most famous amputee in British history. Along with his active zeal and personal recklessness, his passive powers of endurance during surgery helped make him a ‘heroic sufferer’ in the words of an 1836 biography. Even while he was still alive there was a sense that he was a kind of secular saint, dedicated to his country’s cause, disregarding pain and death. The surgical and military mutilations of his body would play a major role in nineteenth-century British Romantic Militarism and in the national romance of a country that often wished to see itself as essentially Nelsonian – bold, loyal, selfless and Stoical. Nelson seems to have been mindful of appearances and future legends in terms of his experience of surgery. A sense of Nelson’s own vision of his role might be gleamed from the fact that he owned a portrait of himself, attributed to Guy Head, that showed him bloodied, emphasising his lost arm. After he lost an arm to amputation with the Yorkshire surgeon Thomas Eshelby at the Battle of Santa Cruz de Tenerife in 1797, where a musket ball shattered his arm, he wrote that he had ‘expected such an event’ and saw divine intervention behind his survival. His main complaint had been about the coldness of the knives. 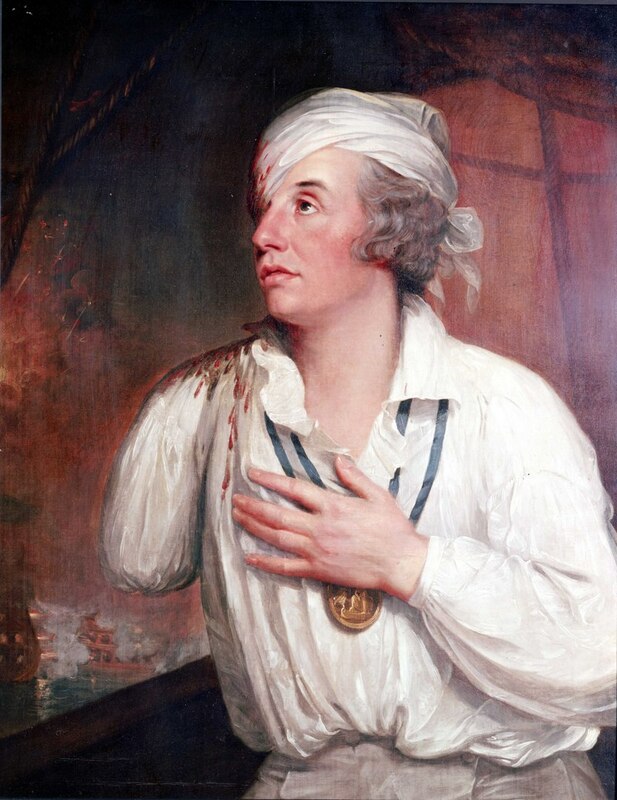 Nelson’s Norfolk protégé Captain Sir William Hoste recorded that the admiral ‘underwent the amputation with the same firmness and courage that have always marked his character’, and that, ‘he told the surgeon to get his instruments ready, for he knew he must lose his arm, and that the sooner it was off the better’. Subsequent observers were drawn to heroic stories about the scene. The Aberdeen Press and Journal in 1845, for instance, repeated the anecdote that, ‘When Nelson’s arm was cut off, the surgeon asked if he should embalm it, to send it back to England to be buried; but he said, “Throw it into the hammock, with the brave fellow that was killed beside me” – a common seaman’, stressing the admiral’s bond with his men, a key feature of tales of his surgical fortitude. Nelson’s self-consciousness about his actions was also apparent when he was injured in his forehead during the Battle of the Nile. Thinking he was dying, Nelson ‘began to “perform” the Death of the Hero’, as Lambert has put it. His model in this regard appears to have been the death of Wolfe in Quebec in 1759, and the famous painting of that death scene by Benjamin West. Carried down to the cockpit to be seen by the surgeon, Nelson refused to be seen before the men already there, again emphasising unity with his men. As Robert Southey put it in his influential Life of Nelson, ‘“No!” said Nelson, “I will take my turn with my brave fellows”’. Nor would he suffer his own wound to be examined till every man who had been previously wounded was properly attended to. Fully believing that the wound was mortal, and that he was about to die, as he had ever desired, in battle and in victory, he called the Chaplain’. This stirring scene in naval surgery swiftly became a standard part of patriotic literature, from Tales of the Wars (1836) to Mason’s Great Triumphs of Great Men (1875). Later narratives of the death scene and its surgical element reflected changing moral ideas and the ideological context. For instance, Clarke and M’Arthur’s influential Life and Services of Horatio Viscount Nelson cut out not only embarrassing references to his mistress Lady Hamilton but also seriously toned down descriptions of Nelson’s pain, making the scene, which in reality was pretty gruesome, a perfect fit for nineteenth-century myth-making. Nelson’s death took tales of his fortitude in surgery to unprecedented heights in national consciousness. The British state arranged an enormous funeral, deliberately playing down his peerage to emphasise the unity of officers and men, and made use of the symbolic power of his image in countless ways over the following decades. Objects related to the cult of Nelson’s surgeries had relic status already during his lifetime. The surgeon Thomas Pettigrew’s memoir of the admiral includes a description of an encounter between him and a ‘loudly huzzaing’ former crewmate in a crowd. He gave the man a present, at which the man showed him a piece of lace torn from the sleeve of the amputated arm, telling him that he would ‘preserve it to the latest period of his life, as a token in memory of his gallant commander’. Similarly, the coat with a bullet hole that Nelson wore at Trafalgar remains an important relic in the National Maritime Museum in Greenwich. 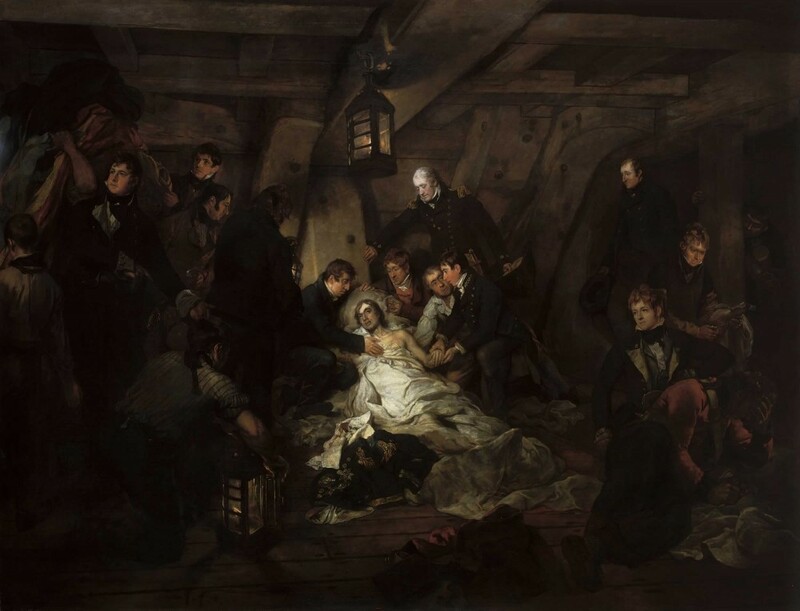 There is perhaps no particular reason to disbelieve or play down stories of Nelson’s composure in surgery, but it is possible to view the myth of the heroic sufferer in a less celebratory light. Some critical voices have gone as far as to wonder if Nelson might have been a ‘manic depressive’ with a taste for blood. Although, as an amputee with one eye and a slightly effeminate manner, he was by no means a straightforward macho hero, he came to represent a masculine ideal at a time when the mass mobilisation of men was powerfully changing conceptions of manhood. His legendary fortitude in surgery was a central aspect of the ‘version of stoic, affective, masculinist patriotism in the service of the nation-state’ that Kathleen Wilson has seen as embodied by Nelson, and, as she notes, that vision of the British state is still with us in many ways. Indeed, in his bold courting of danger and injury and his comradely patriotic endurance of the agonies of surgery, one could go as far as to see him as the chief willing sacrificial victim of the British cause in the wars. The Nelson case is thus an illuminating example of the relationship between the complex subjective reality of pain in surgery and the role of culture in mediating both the experience itself and its subsequent meanings. Matthew Henry Barker (‘An Old Sailor’), The Life of Nelson (London: Frederic Shoberl, 1836), p. 177. Timothy Jenks, Naval Engagements (Oxford: Oxford University Press, 2006), p. 198. Colin White, ‘Nelson Apotheosised: The Creation of the Nelson Legend’, in David Cannadine (ed. ), Admiral Lord Nelson: Context and Legacy (Basingstoke: Palgrave Macmillan, 2005), pp. 93-114, at p. 95. Andrew Lambert, Nelson: Britannia’s God of War (London: Faber and Faber, 2005), p. 180. Memoirs and Letters of Sir William Hoste, 2 vols (London: Richard Bentley, 1833), 1.74. Anon., ‘Anecdote of Nelson’, Aberdeen Press and Journal 24 December 1845, p. 4. Andrew Lambert, Nelson: Britannia’s God of War (London: Faber and Faber, 2005), pp. 128-9. Robert Southey, The Life of Nelson (London: Routledge, 1878), p. 89. James Mason, Great Triumphs of Great Men (London: William Nimmo, 1875), p. 86. Tales of the Wars (London: William Mark Clark, 1836), p. 198, Samuel Beeton, Beeton’s Hero Soldiers, Sailors and Travellers in Kafirland (London: Ward, Lock, and Tyler, 1873), p. 99. William Beatty, Authentic Narrative of the Death of Lord Nelson (London: T. Davison, 1807), p. 18. Thomas Pettigrew, Memoirs of the Life of Vice-Admiral Lord Nelson (London: T. and W. Boone, 1849), p. 406. William James, The Naval History of Great Britain, 6 vols (London: Harding, Lepard, and Co., 1826), 4.120. Kathleen Wilson, ‘Nelson and the People: Manliness, Patriotism and Body Politics’, in David Cannadine (ed. ), Admiral Lord Nelson: Context and Legacy (Basingstoke: Palgrave Macmillan, 2005), pp. 49-66, at pp. 49-50.